Azure Cosmos DB is a globally distributed, multi-model database service. It offers turnkey global distribution, guarantees single-digit millisecond latencies at the 99th percentile, and elastic scaling of throughput and storage. Based on user feedback, we’ve redesigned the object model to make it easier to interact with and perform operations against Cosmos DB. We also got feedback that it was difficult to do operations off databases, collections, or documents since each method needed to reference the URL of that resource. 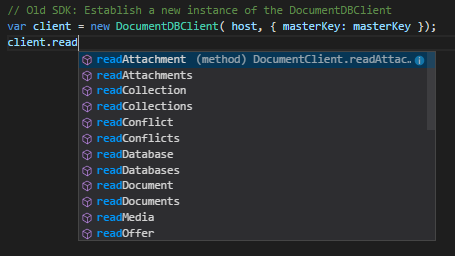 To address this, we’ve created a new top level CosmosClient class to replace DocumentDBClient, and split up its methods into modular Database, Container, and Items classes. 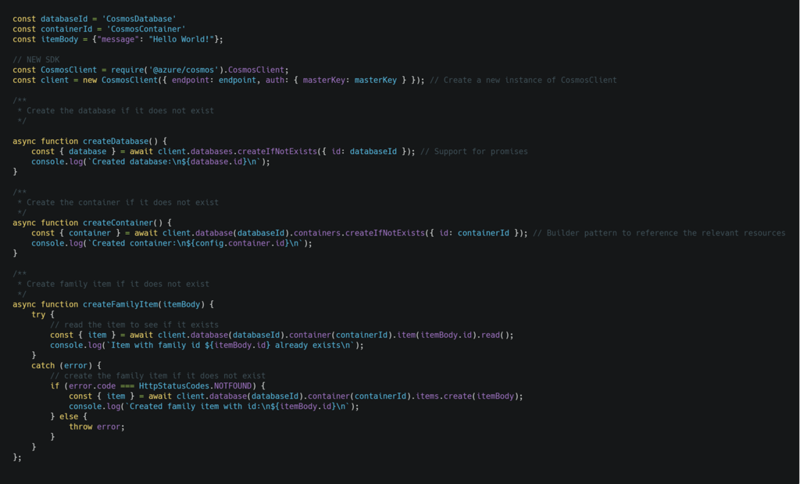 For example, in the new SDK, you can create a new database, container, and add an item to it, all in 10 lines of code! This is called a “builder” pattern, and it allows us to reference resources based on the resource hierarchy of Cosmos DB, which is similar to the way your brain thinks about Cosmos DB. For example, to create an item, we first reference its database and container, and call items.create(). An account can have one or more databases, and a database consists of one or more containers. 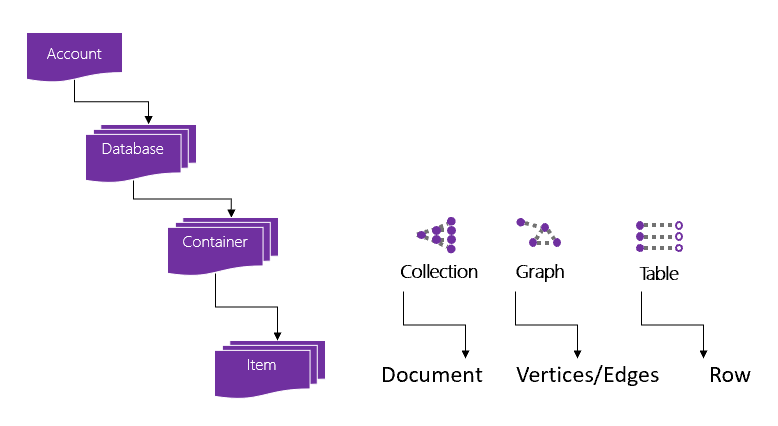 Depending on the API, the container is projected as either a collection (SQL or Azure Cosmos DB for MongoDB API), graph (Gremlin API), or table (Tables API). Finally, we’ve added full support for promises so you no longer have write custom code to wrap the SDK yourself. Now, you can use async/await directly against the SDK. 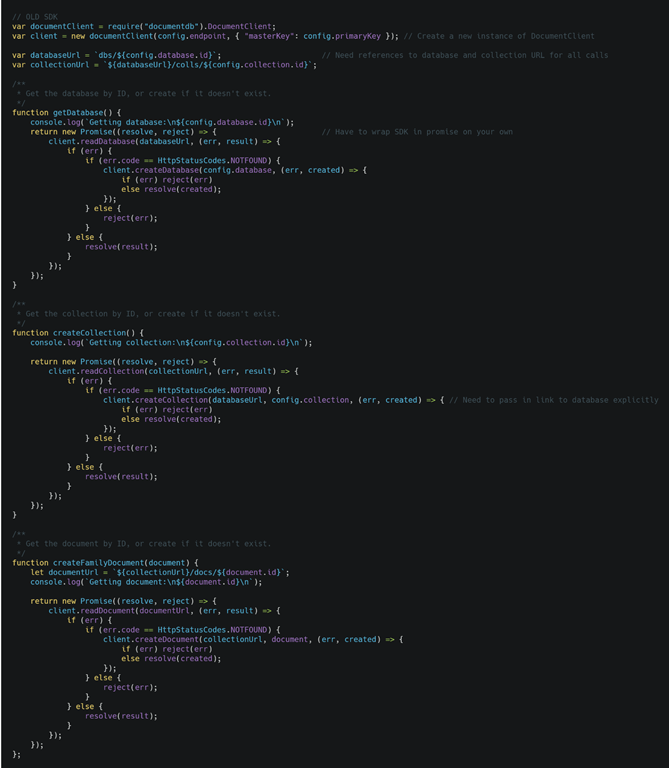 In the new SDK, you can simply await the calls to Cosmos DB directly from inside an async function, as seen below. We’ve also added a convenience method createIfNotExists() for databases and containers, which wraps the logic to read the database, check the status code, and create it if it doesn’t exist. We hope this new SDK makes for a better developer experience. To get started, check out our quick start guide. We’d love to hear your feedback! Email cosmosdbsdkfeedback@microsoft.com or log issues in our GitHub repo.